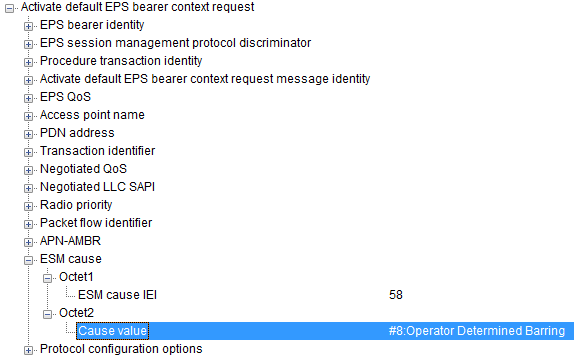 The purpose of the ESM cause information element is to indicate the reason why a session management request (e.g, PDN Connectivity Request) is rejected (e.g, PDN Connectivity Reject) or restricted (e.g, Activate default EPS bearer context request). There are roughly two type of NAS message that carry ESM Cause. One is Activate default EPS Bearer Request which is used to accept the IP that UE requested and another message is PDN Connectivity Reject which is used to reject the PDN that UE requested. If you expend this table into more detailed cases, we can describe the cases as follows. Note (*) : "Single Bearer" indicate Network allows 'single address bearer only'. If the UE requests for PDN type IPv4v6, but Network allows IPv4 only or IPv6 only for the requested APN for various reason, the network shall override the PDN type requested by the UE to be limited to a single address PDN type (IPv4 or IPv6). In the ACTIVATE DEFAULT EPS BEARER CONTEXT REQUEST message sent to the UE, the network shall set the PDN type value to either "IPv4" or "IPv6" and the ESM cause value to #50 "PDN type IPv4 only allowed", or #51 "PDN type IPv6 only allowed", respectively. The UE shall not subsequently initiate another UE requested PDN connectivity procedure to the same APN to obtain a PDN type different from the one allowed by the network. has not been allocated an IP address for this APN, shall set the PDN type IE to IPv4v6. has been allocated an IPv6 address for this APN and received the ESM cause #52 "single address bearersonly allowed", and is requesting an IPv4 address, shall set the PDN type IE to IPv4.